Unite has opened its London headquarters as an emergency shelter for rough sleepers. Unite general secretary Len McCluskey said: “Unite has been proud to help out during these bitter cold nights, but we are under no illusion that so much more needs to be done to tackle this increasing tide of human misery. “The UK is the sixth biggest economy on the planet; it ought to be capable of putting a roof over the head of every citizen, but the fact that it does not is the direct consequence of failed Conservative austerity policies. “Today’s latest figures make very depressing reading and Theresa May needs to acknowledge that the harsh austerity regime is not over by a long chalk. “The people, who slept in camp beds at Unite’s headquarters, have no place to call home, which is a tragic reminder that the government’s continuing cuts are destroying lives. “I want to thank Unite’s members at St Mungo’s for the incredible work they do to provide help for people in need all the year round, but especially at this time of year, when the weather can be so cruel and unforgiving. 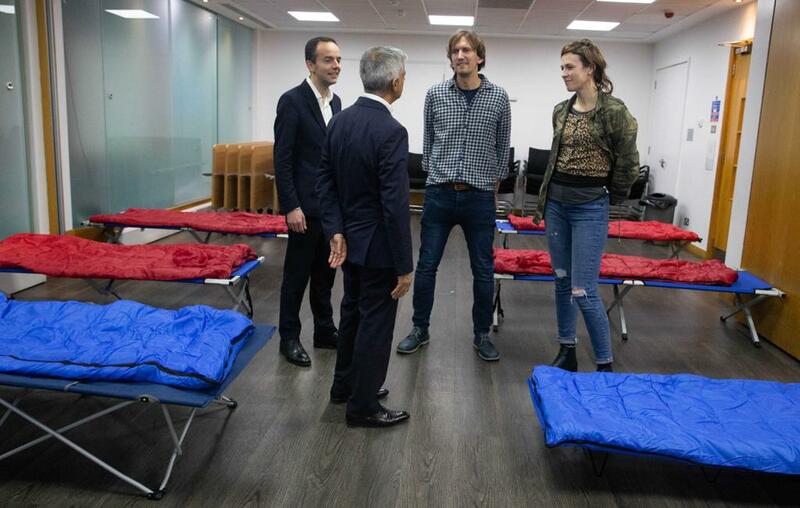 Sadiq Khan, the mayor of London, said: “No one should be sleeping rough in this freezing weather, which is why our emergency shelters are open across the capital every night the temperature drops to zero, offering rough sleepers somewhere warm to stay and further support to help them off the streets for good. WELL DONE UNITE, YOU ARE SAVING LIVES ! We can truly see who really cares about the vulnerabile and those who need help. Not this government that’s for sure! Thank you, Unite! I am extremely proud of Unite today!